On the sun, what you can't see can fry you. The sun rotates so slowly that it takes about a month to complete one turn, meaning that activity on its farside is hidden for up to two weeks at a time. If a giant magnetic storm is brewing on the farside, it will hit Earth with a flood of radiation as it finally rotates into view. That happened in 2003, when the unexpected blast knocked out communications satellites and interfered with airplane navigation systems. Now scientists using NASA's Solar and Heliospheric Observatory (SOHO) satellite can peer right through the sun and anticipate such storms well before they hit. 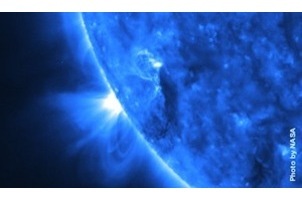 The secret is learning to "see" the sun in sound, says Phil Scherrer of Stanford University. Every second about 7,000 California-size bubbles of hot plasma rise to the surface of the sun and pop, creating a cacophony of sound waves. As the waves reverberate through the interior, they reflect off the surface of the sun's farside before returning to the front, where they create a slight ripple that SOHO's instruments can detect. Sound waves speed up when they hit a magnetically active region on the back side, so if they return to the front a bit sooner than normal, that means a magnetic storm is brewing. The new method should give significantly more advance warning to satellite operators and air traffic controllers. It may help protect astronauts on the moon or traveling to Mars (see "Are We Trapped On Earth?"). "Now we don't have to wait to see the storm," Scherrer says. "You can see that it's coming around the corner."